Sword Master Nintendo NES Video Game Cartridge lot CLEAN & TESTED + FREE SHIP!!! COMPLETE Magic Sword (Super Nintendo Entertainment System, 1992) Cib Nes Tested! 10 product ratings - COMPLETE Magic Sword (Super Nintendo Entertainment System, 1992) Cib Nes Tested! Blaster Master (Nintendo NES 1988) Complete CIB box manual NINTENDO! 62 product ratings - Blaster Master (Nintendo NES 1988) Complete CIB box manual NINTENDO! Lord of the Sword (Sega Master System 1988) COMPLETE w/ Box manual game WORKS! 2 product ratings - Lord of the Sword (Sega Master System 1988) COMPLETE w/ Box manual game WORKS! Demon Sword (Nintendo, 1988). Complete in Box. CIB. NES. Taito. 6 product ratings - Demon Sword (Nintendo, 1988). Complete in Box. CIB. NES. Taito. 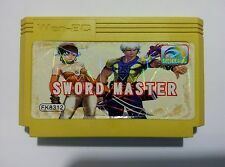 Lord of the Sword (Sega Master System, 1988) - Game Cartridge - TESTED - !!! 2 product ratings - Lord of the Sword (Sega Master System, 1988) - Game Cartridge - TESTED - !!! Trending at $16.85Trending price is based on prices over last 90 days. Wizards and Warriors II: Iron Sword (Nintendo NES) 1989 Cartridge/Manual/Tested! 15 product ratings - Wizards and Warriors II: Iron Sword (Nintendo NES) 1989 Cartridge/Manual/Tested! Demon Sword Nintendo Entertainment System NES Game Cartridge Nice! Demon Sword (Nintendo Entertainment System, 1988) NES Game Cartridge Excellent! 6 product ratings - Demon Sword (Nintendo Entertainment System, 1988) NES Game Cartridge Excellent! This page was last updated: 21-Apr 21:32. Number of bids and bid amounts may be slightly out of date. See each listing for international shipping options and costs.